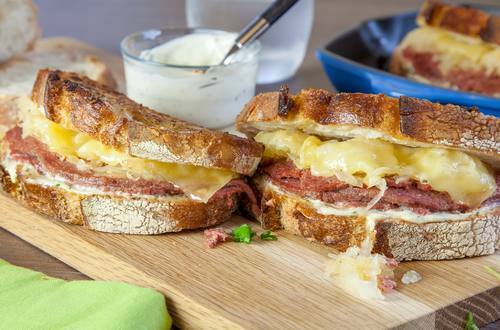 Stacked on rye bread, this hearty Reuben sandwich combines corned beef, sauerkraut, Swiss cheese with deliciously rich Hellmann's® or Best Foods® Real Mayonnaise. 1 Combine Hellmann's® or Best Foods® Real Mayonnaise, sour cream and horseradish in measuring cup or small bowl; brush on 1 side of each bread slice. 2 Top 6 bread slices with corned beef, sauerkraut and cheese, then remaining bread, spread-side down. Brush outside of bread with Country Crock® Spread. 3 Cook sandwiches in large nonstick skillet over medium heat until bread is golden and cheese starts to melt, turning once.